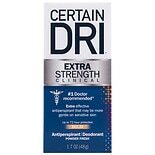 Shop Certain Dri Antiperspirant Solid (1.7 oz. )1.7 oz. $879$8 and 79 cents$5.17 / oz. 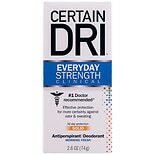 Shop Certain Dri AM Underarm Antiperspirant Refresh (2.6 oz. )2.6 oz. $899$8 and 99 cents$3.46 / oz. 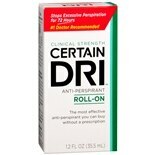 Shop Certain Dri Perscription Strength Roll-On Antiperspirant (1.2 oz. )1.2 oz. Shop Certain Dri A.M. Underarm Refresher Roll On Morning Fresh (2.5 oz. )2.5 oz.